I have about six long, talky blog posts in progress at the moment, but I'm also going through one of those spells when I'm unhappy with everything I write, so it's maybe going to be a while before any of them get published. In the meantime, I've bought two more plants, that aren't even Anthuriums, so let's look at those. 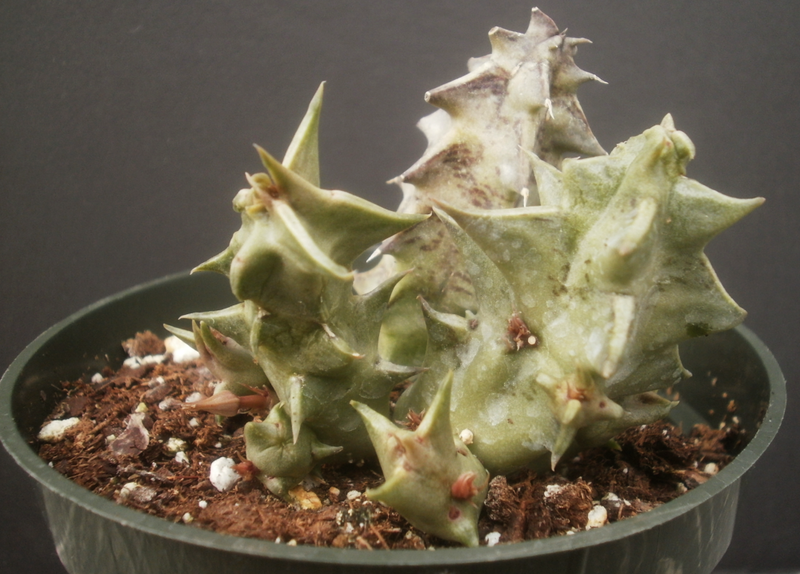 First up is a Huernia. They had several specimens of this particular plant, one of which was flowering already. 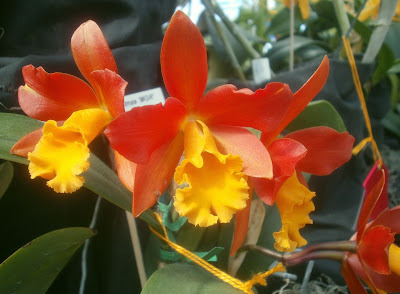 I didn't buy that one because there were aphids all over the flower. (Fortunately, there were several other specimens available.) I tried to get a flower photo anyway, but it didn't turn out well. I'm a little hesitant about the ID; it was tagged as H. oculata, which has the most amazing flowers, but the flower doesn't match very well. In particular, that part at the center should be a lot lighter and more uniform in color. A little mottling is one thing, but that picture above is a lot more heavily patterned than I feel H. oculata ought to be. 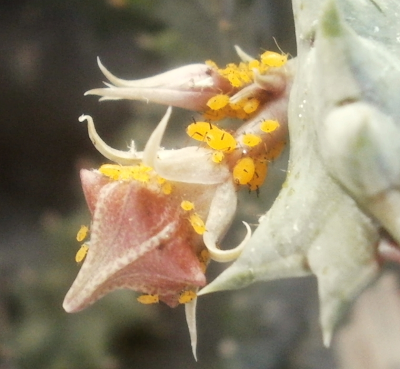 I couldn't find any flower photos that matched any better, so it's possible that the one I took a picture of was immature, distorted by the aphids, or otherwise atypical, but in any case I'm not ready to say for certain that I have H. oculata. My plant has a few tiny flower buds on it, so we'll see what those look like. I'll also keep an eye out for aphids. I had aphids on the Huernia zebrina last summer. They appear to be a common stapeliad problem. 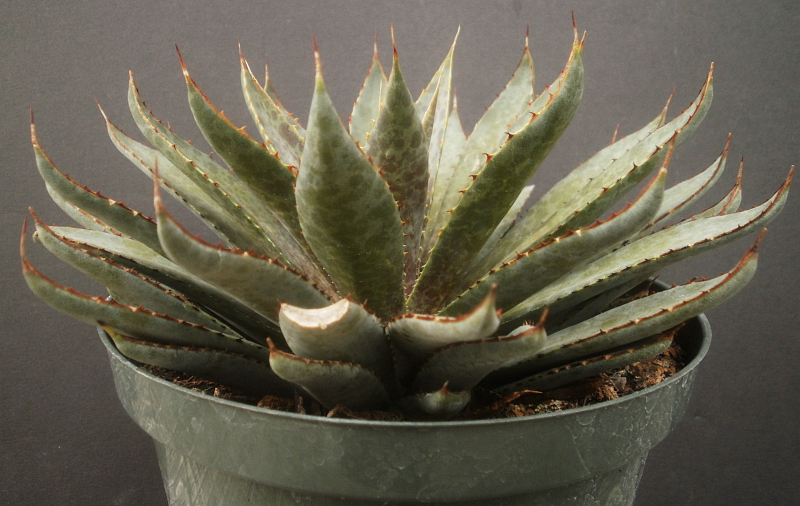 The other plant I got at Reha's was Mangave 'Bloodspot.' This may or may not turn out to be a good idea; one of my two Mangave 'Macho Mocha' specimens lost a lot of leaves during the winter and is presently on the verge of death,3 and 'Macho Mocha' is, I think, the only Manfreda, Agave, or Mangave I have that hasn't had scale problems yet. So this is possibly a group of plants I should be more wary about. But you know how it is. It was only $8, so if the purchase turns out to have been a bad idea, it was at least not a very bad idea. And I assume I'll get to enjoy it outside for a summer first. 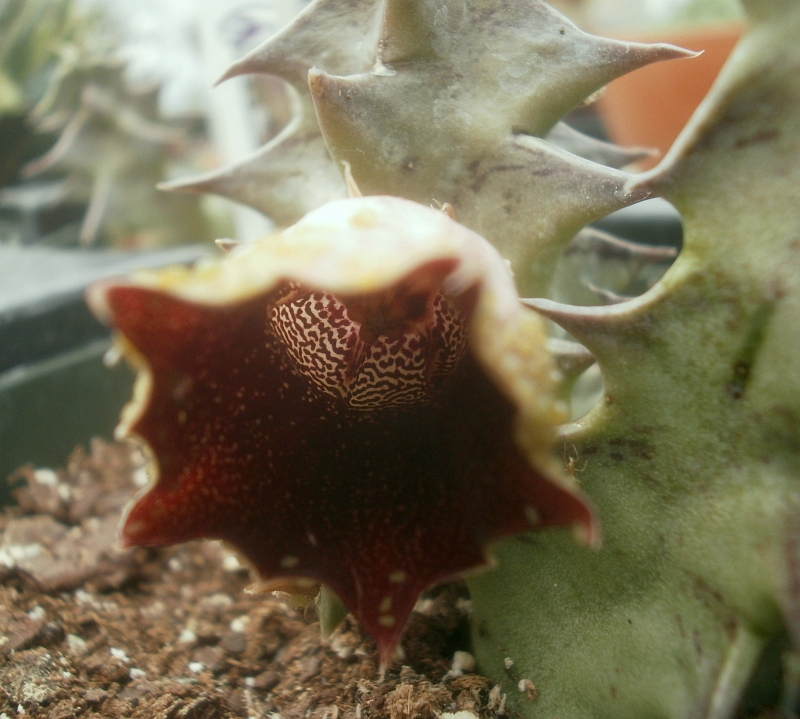 1 Stapeliads are Stapelia, Huernia, Orbea, and related plants. 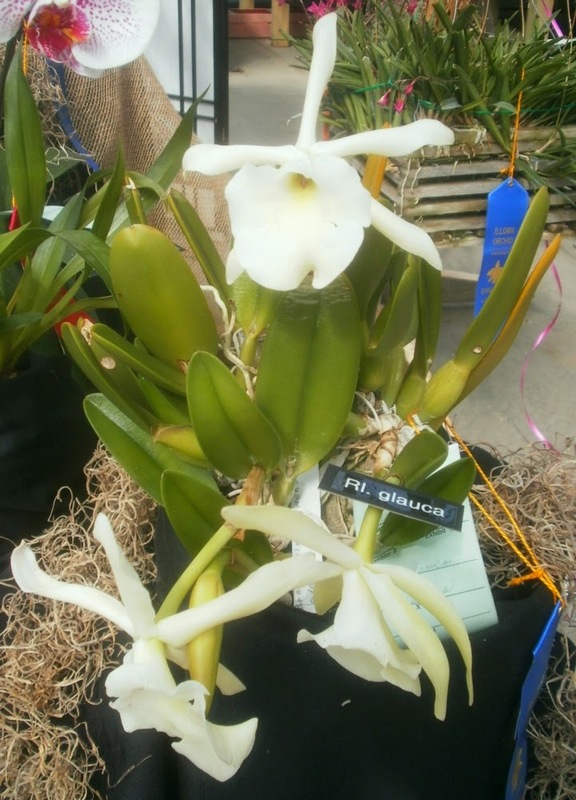 Those three are the most common in cultivation, but there are a bunch of others. 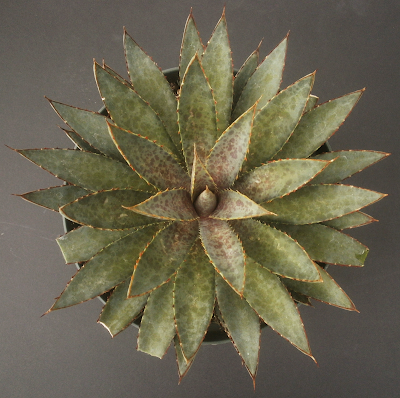 Especially notable among the others is Edithcolea grandis, which gets attempted a lot because the flowers are impressive, but it's apparently difficult to grow. I say they're "the best" because a few of them do extremely well for me. 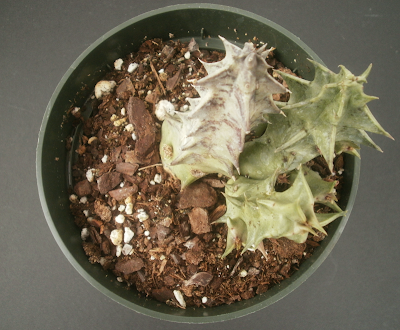 Huernia schneideriana (which I got from Liza) and Stapelia gigantea are a couple of my favorite plants. H. schneideriana bloomed all winter long even though it wasn't receiving that much light; S. gigantea has all kinds of fun textures and smells and is one of the easiest plants I grow. 2 Let's hear it for Reha's Greenhouses. They're also about $6 cheaper per bag than the ex-job on the brand of potting soil I like, which I wish I'd known before buying a bag at the ex-job. 3 The one that's doing poorly was about 8 inches from an obstructed west-facing window, and also probably stayed wetter longer because it was in a larger pot. The other one was on a south-facing windowsill, so it got a lot colder, but it also probably dried out faster and saw more sun. 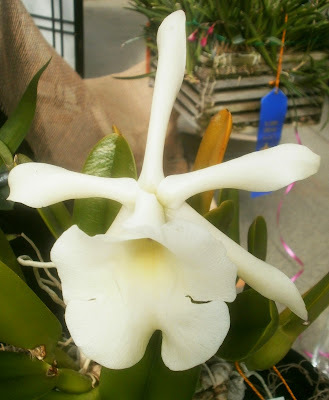 And the photos from the 2014 orchid show begin. I said previously that I always say that I think the photos are better than the previous year's, but this year I think it might actually be true. Mostly because last year's batch was so crappy: so many blurry photos because I couldn't get close enough to the flowers and didn't want to step over the rope to get closer. This year I did step over the ropes to take pictures, once, but for the most part I didn't need to: the set-up this year was a lot more sensible. Even when I did step over the ropes, nobody yelled at me, so it's probably not that big of a deal, but the important part is that I felt like a bad boy. For the record, I didn't intend to follow one Rhyncattleanthe with another Rhyncattleanthe. It was accidental.